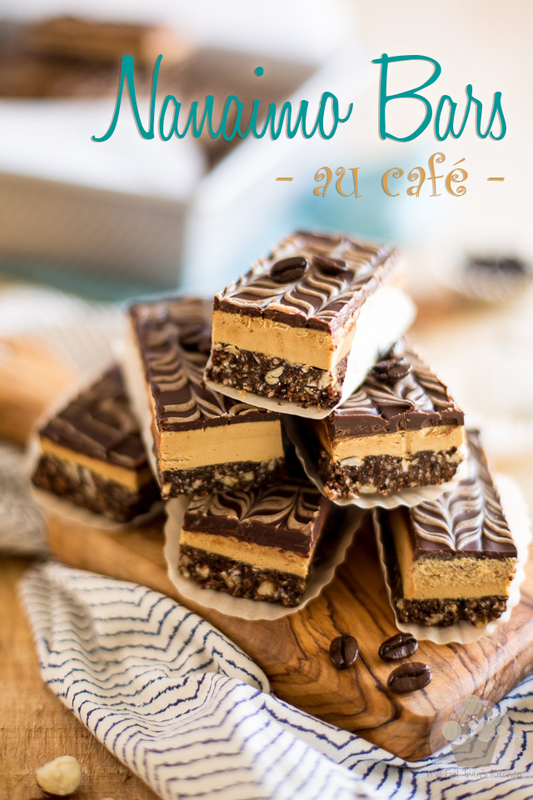 These Coffee Nanaimo Bars are a delicious variation on this great Canadian classic. 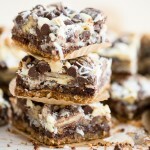 The addition of Espresso powder really takes these treats over the top! 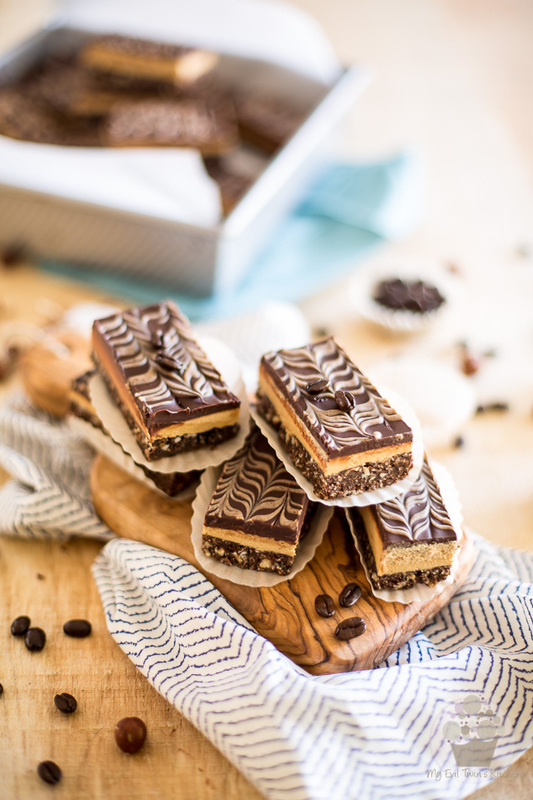 These Coffee Nanaimo Bars mean serious business! Talk about taking an amazing classic Canadian treat to the next level (or maybe even the one after that) with a few very simple additions. It’s crazy what a little bit of coffee and a handful of chopped toasted hazelnut will do to an already insanely delicious treat. When I first got to sink my teeth into one of these babies, I was about 5 hours into an intense tattoo session and was in great need of a little something to sooth my body and soul. Just one bite totally did the trick: I was sent straight to gustatory paradise and forgot all about the pain that I’d just endured (or well, almost…) and was ready for more! But hey, you don’t HAVE to go through all the suffering just so you can have one, you know. 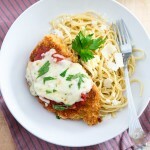 You only need spend a little bit of time in the kitchen. And please, don’t let the rather lengthy recipe discourage you, they’re really not that complicated to make, you’ll see. 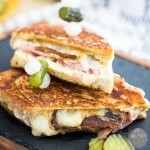 All I can say is they are totally worth every single second spent in the kitchen… and then some! 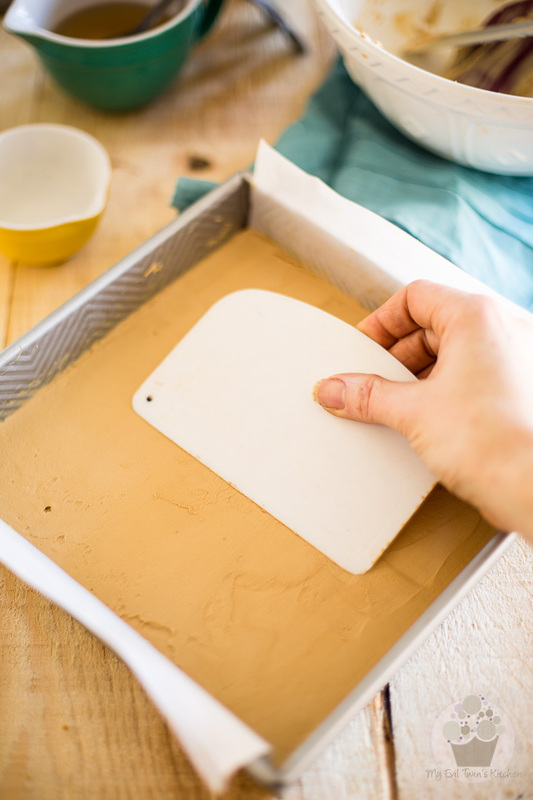 Start by lining an 8” square baking pan with parchment paper, leaving a bit of an overhang over the edges of the pan. This simple precaution will make it so much easier to remove the bars later. 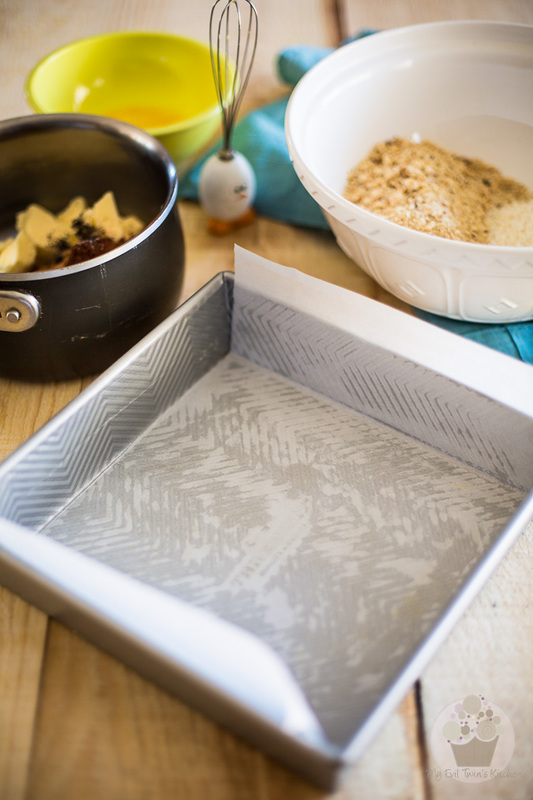 To make sure that your parchment papers adheres well to all surfaces, you’ll want to grease the pan first. In a medium saucepan set over low heat, combine some butter, cacao powder, brown sugar, instant espresso powder and ground cinnamon. Cook, stirring often, until the mixture becomes really nice and smooth. 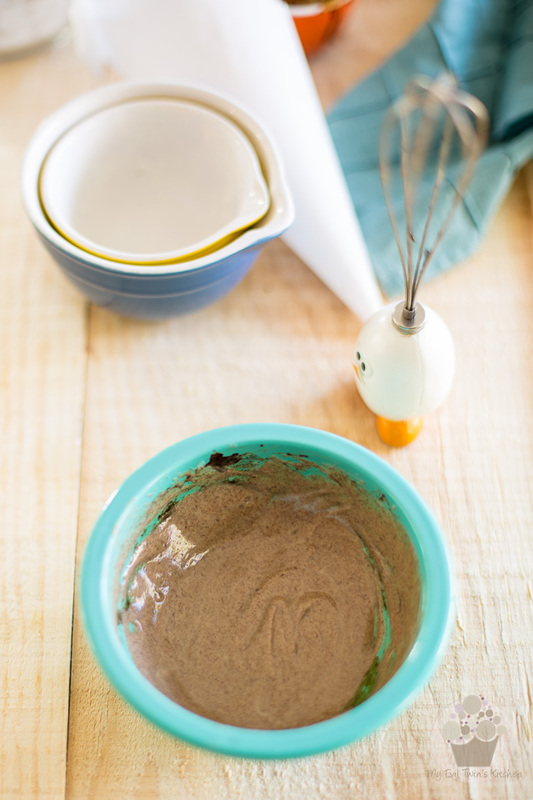 Remove from heat, throw in a beaten egg and whisk vigorously until the mixture starts to thicken, about 30 seconds. 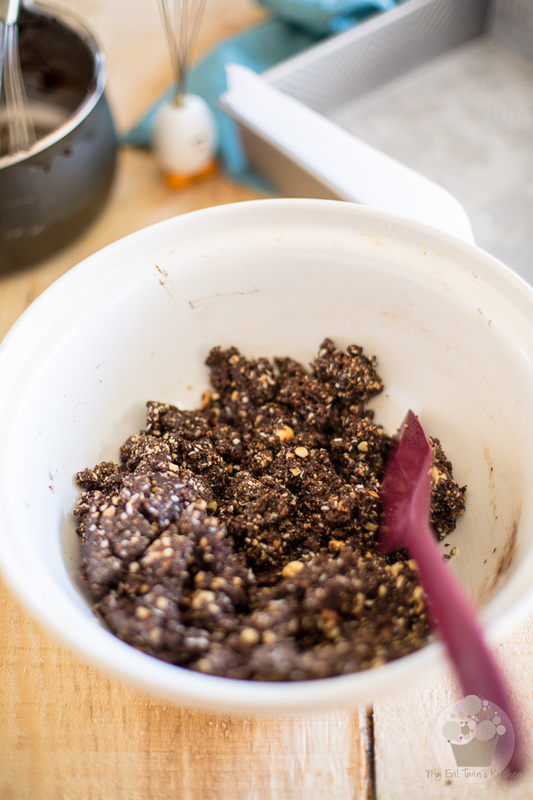 In a large mixing bowl, combine the graham crumbs, dried coconut and toasted hazelnuts and then pour in the melted chocolate mixture. Now mix well with a large spoon or spatula until all the ingredients are thoroughly combined. With the help of a flat object such as a drinking glass or measuring cup, press this mixture evenly into the prepared pan, then place it in the freezer or refrigerator until set, at least 15 to 30 minutes. 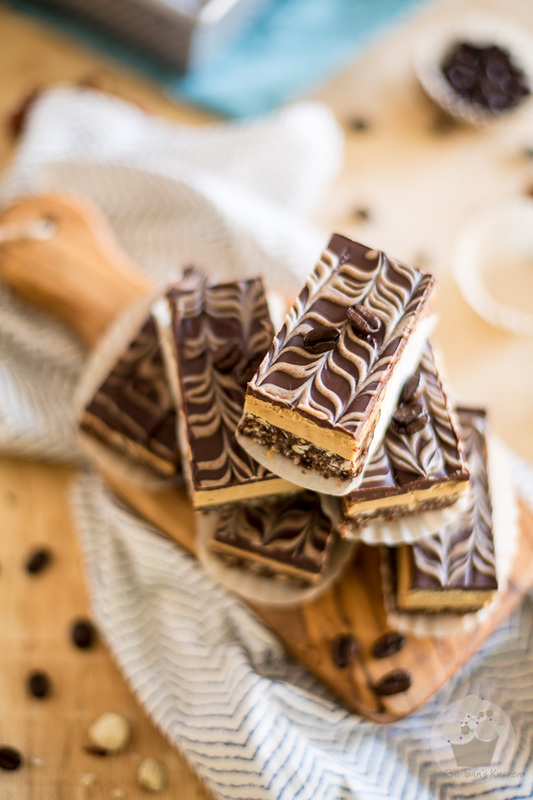 You want to make the layers as even as possible, as this will ensure that your bars look nice and straight when you cut them into individual treats. If you happen to have one of those plastic bowl scrapers, now would be a good time to take it out. They do a fantastic job at flatting things down. 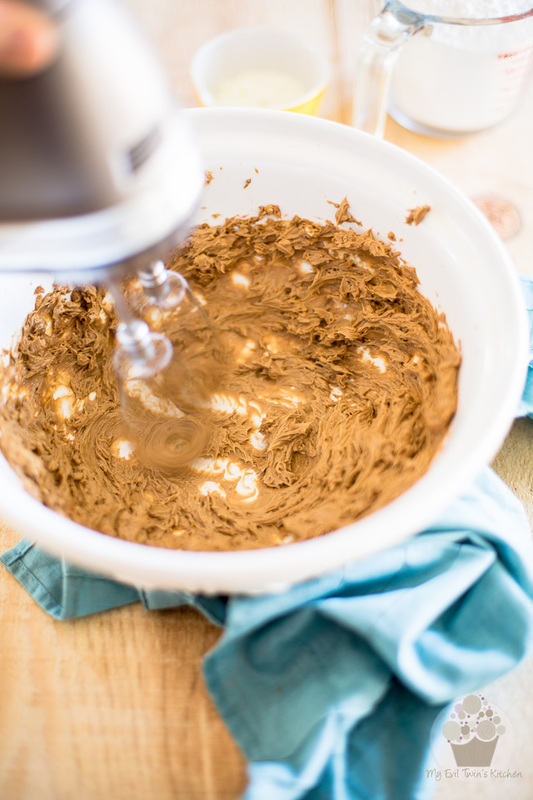 Dilute the instant coffee powder in the hot water and put that in a large mixing bowl, along with the butter. 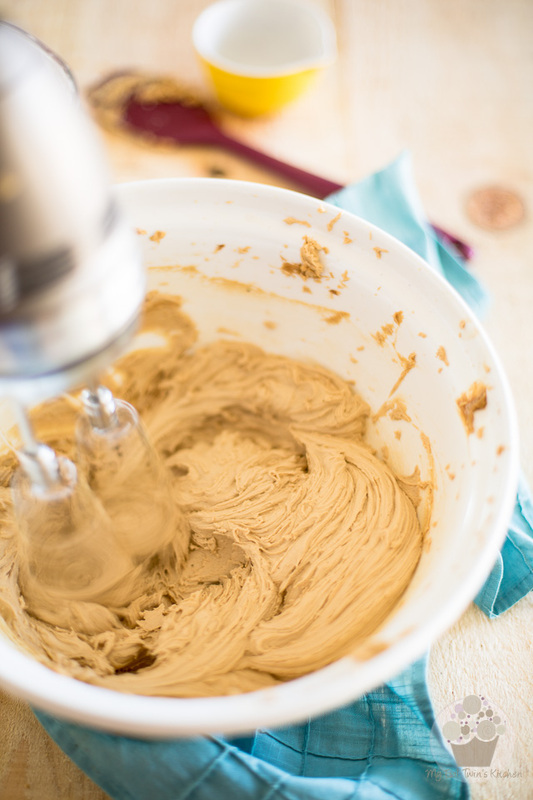 Mix with a hand mixer on medium-high speed until well combined. …and resume mixing until well incorporated. 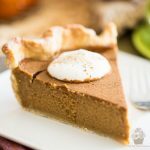 …and progressively moving to high, so you can incorporate a decent amount of air into the mixture, until the filling becomes super fluffy, smooth and creamy. Spread that filling as evenly as you possibly can over the base, then return your pan to the freezer or fridge until firm, 30 to 60 minutes. Again, a plastic bowl scrapers would be the ideal tool to get that top really nice and flat. First, you’ll need to prepare a piping cone out of parchment paper, to drizzle your chocolate later. Alternatively, you could use a resealable plastic bag and make a small hole in one of the bottom corners, to use it as a disposable piping bag. The reason we don’t want to use water here is that it would cause the chocolate to seize, which would make it hard and crumbly and totally unusable. Now melt the white chocolate in the microwave and then add it to the coffee/butter mixture. Mix with a small whisk until well combined. 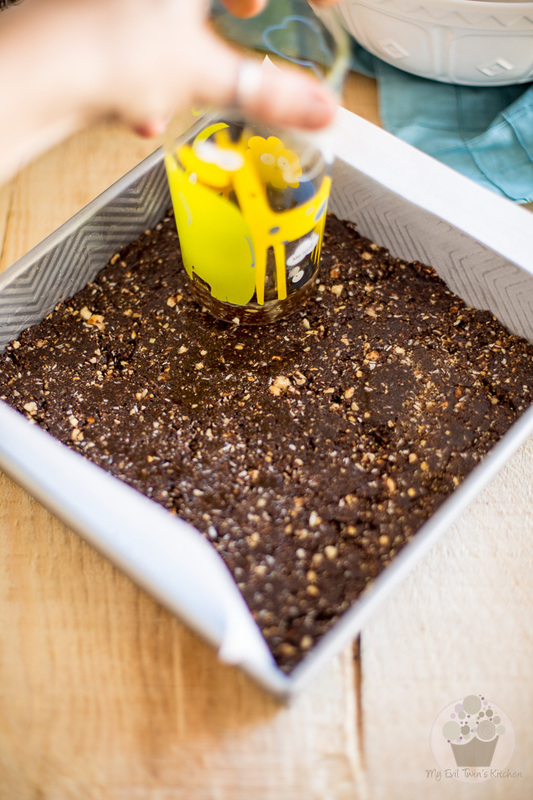 Pour that in your paper cone (or plastic bag) and set aside. 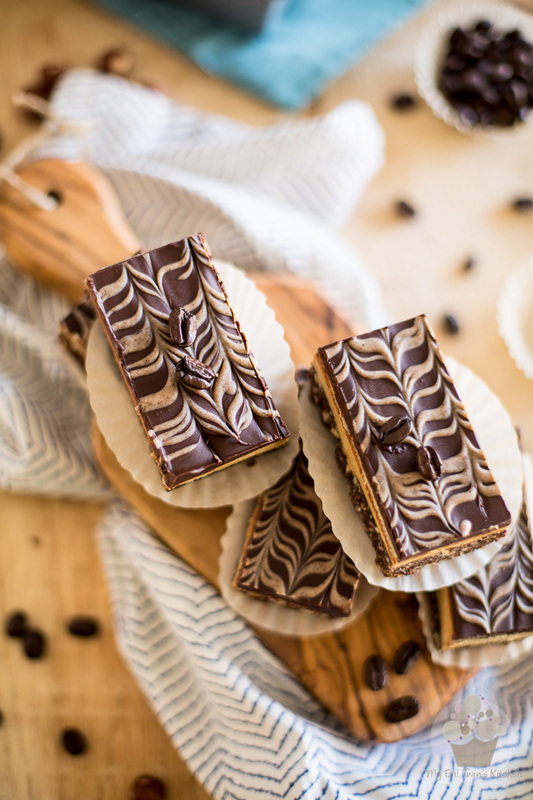 Oh, and if you still wanted to make the feather pattern but didn’t want to go through all the trouble of making the coffee flavored chocolate, you could simply use melted white or milk chocolate instead. It would definitely do the trick, just so long as you have some kind of a color contrast. 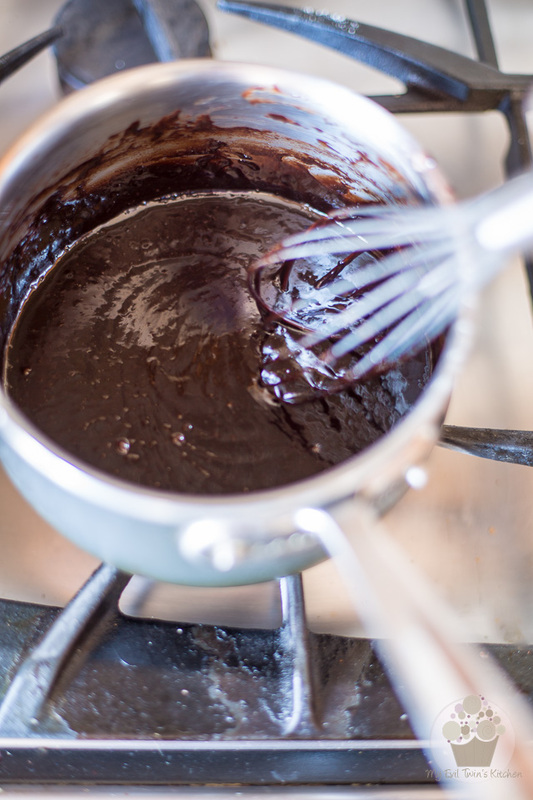 Combine the chocolate and butter in a medium bowl and melt over a double boiler or in the microwave. If using the microwave, make sure you stop and stir every 30 seconds, or you may end up burning your chocolate. Whatever you do, do not let your chocolate get excessively hot, otherwise it would melt your beautiful flat layer of coffee filling. You just want to get that chocolate hot enough to melt completely. Stir that melted chocolate until smooth and silky, then pour it over the coffee layer. 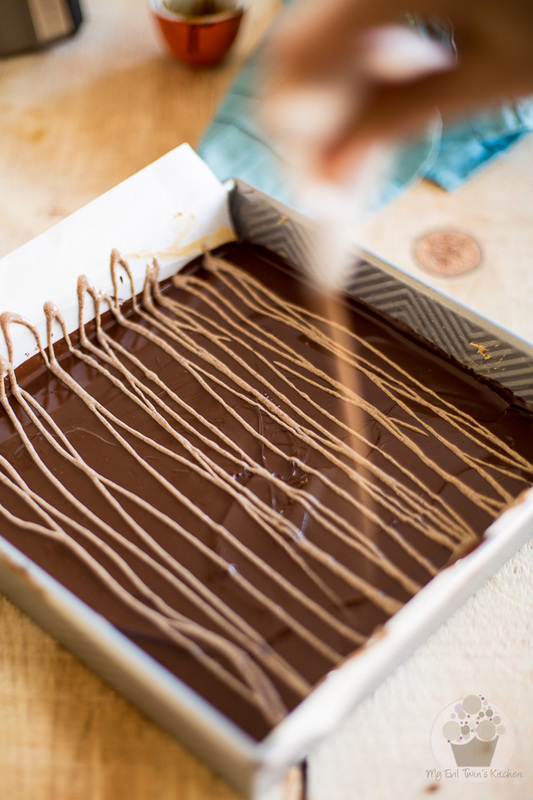 With the help of a spatula, spread the chocolate as evenly as you can and all the way to the edge, then bang the pan a few times on the counter to help that chocolate layer really flatten out. Work as quickly as you can, before it has a chance to set. This is a lot easier than you may think and adds such a beautiful, elegant look to your bars, I say you should definitely give it a try. 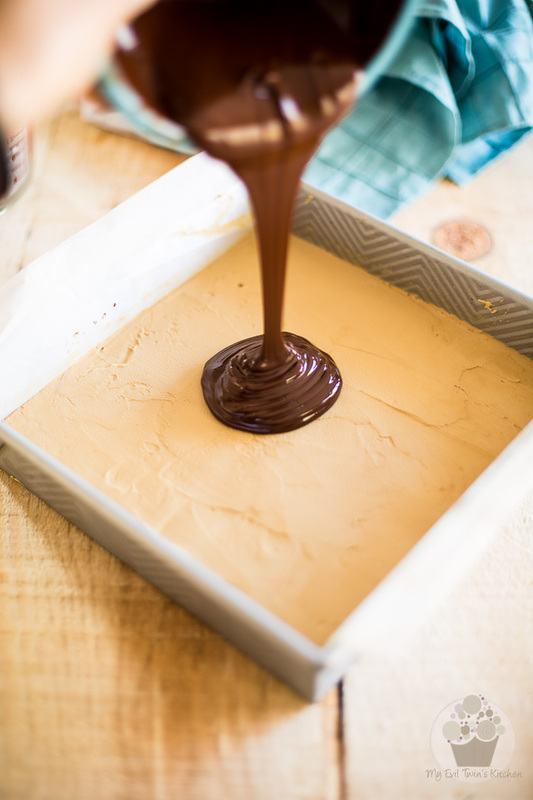 To make it, quickly drizzle the melted coffee flavored (or white, or milk) chocolate over the dark chocolate topping. Work in a back and forth motion, creating straight parallel lines as you go. 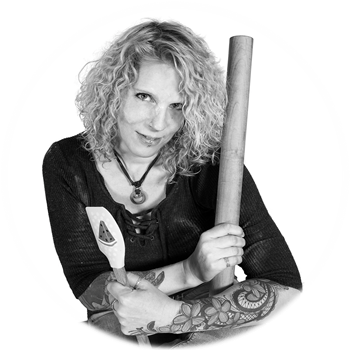 Then, take a long wooden skewer and carefully pull it across the lines in one direction, then in the opposite way. Repeat going left, right, left, right, until you have completed the design. Freeze or refrigerate the bars once again to let the topping cool and set, about 15 minutes. Final step – the cutting and tasting! 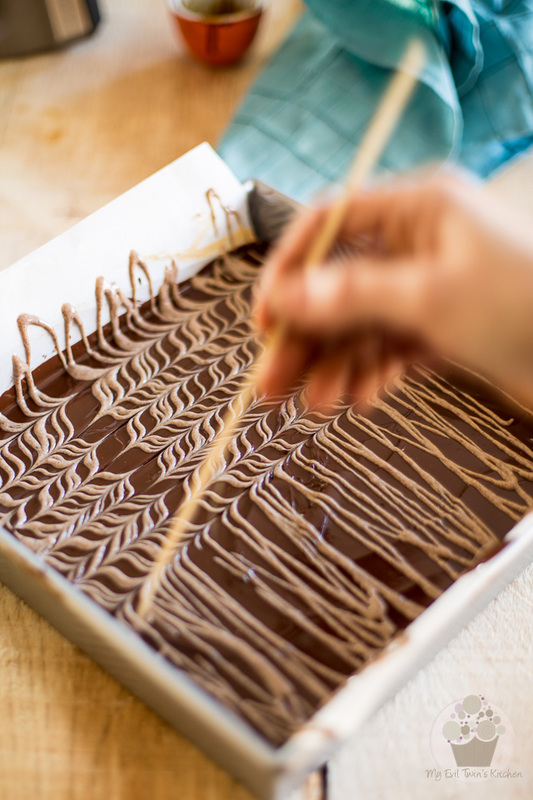 Once the chocolate topping has set, remove the bars from the pan: simply hold the edges of the overhanging parchment paper to gently lift them out. 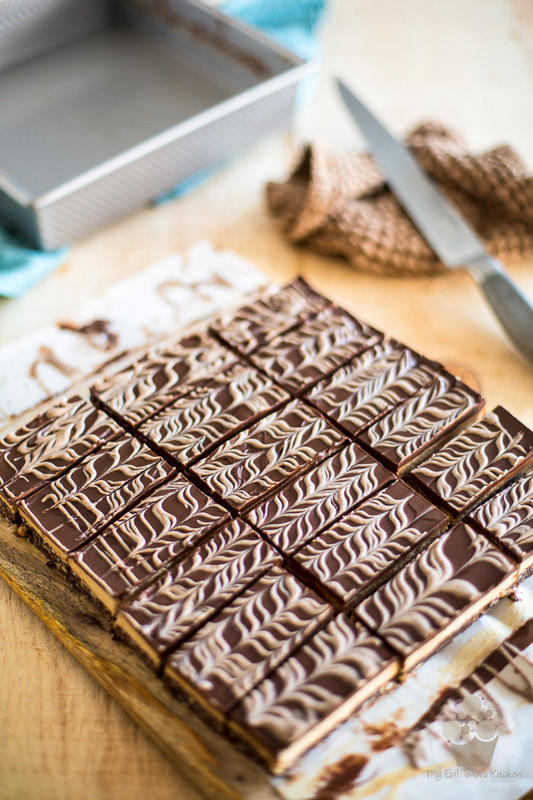 Use a long sharp slicing knife to cut into 16 bars. For cleaner looking bars, run the knife under hot water and then wipe it dry after each cut. Store in the refrigerator for up to 5 days… if they last that long! 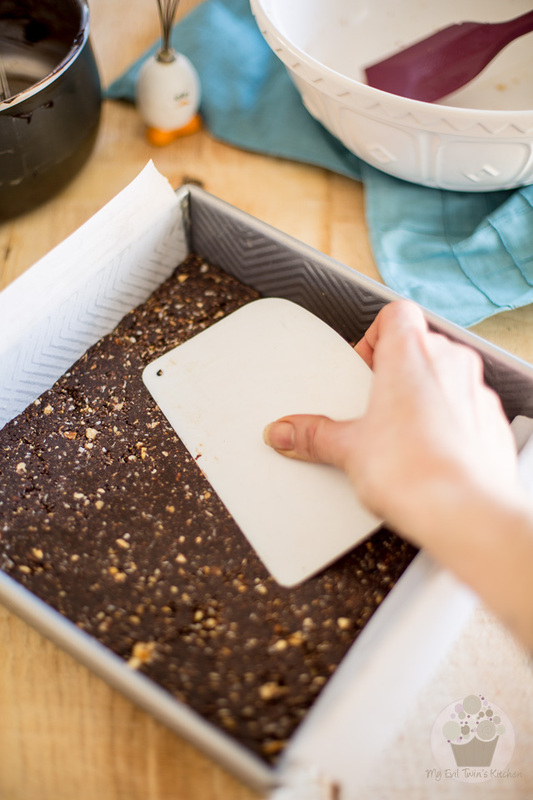 Line an 8” square baking pan with parchment paper, making sure that it hangs over the edges of the pan (this will make it easier to remove the bars later). 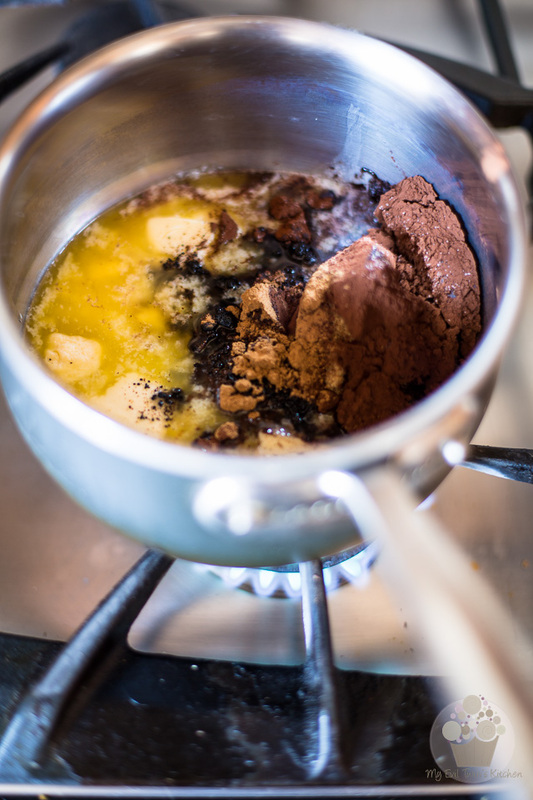 In a medium saucepan set over low heat, combine butter, cacao powder, brown sugar, espresso powder and ground cinnamon. Cook, stirring often, until the mixture is really nice and smooth. 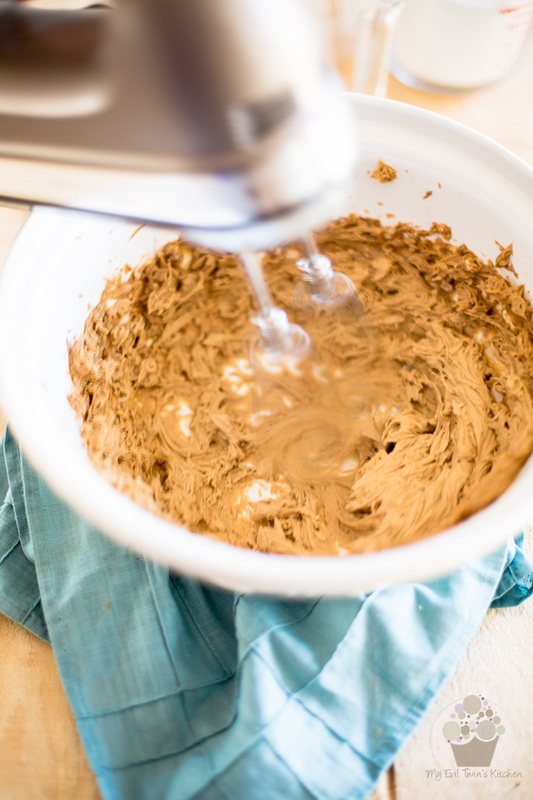 Remove from heat, whisk in the egg and whisk vigorously until the mixture starts to thicken, about 30 seconds. 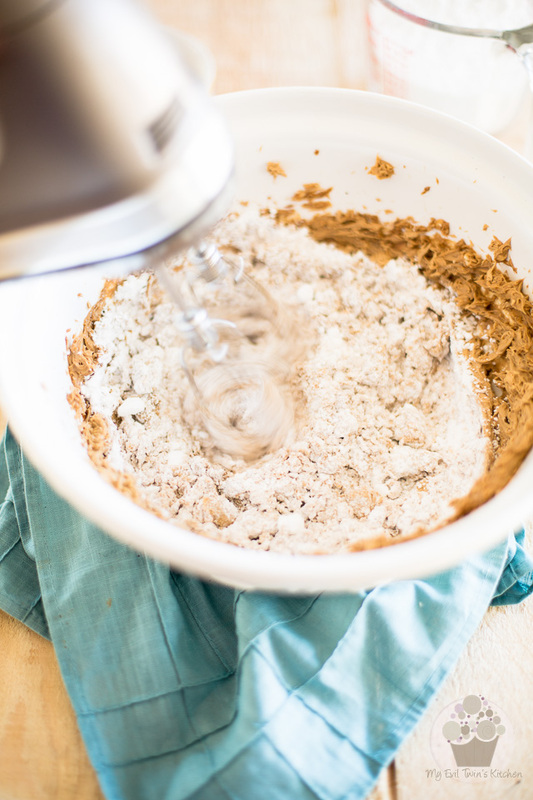 Combine the graham crumbs, coconut and toasted hazelnuts in a large mixing bowl. 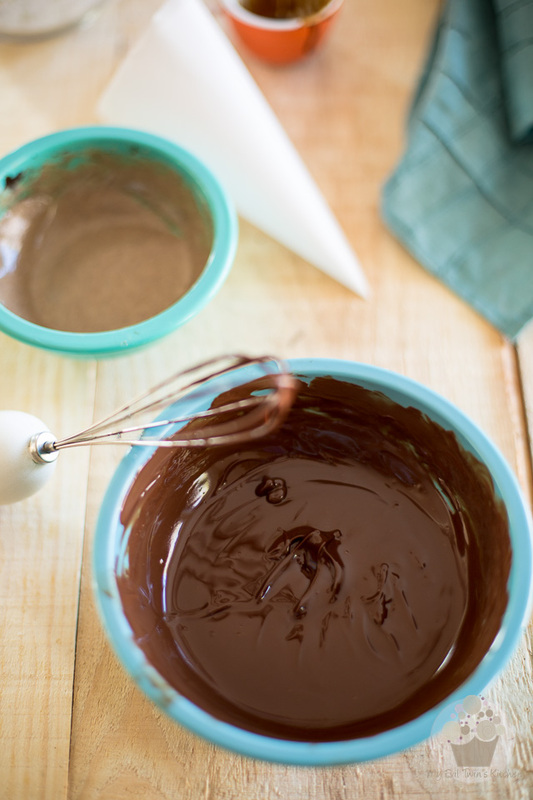 Add the melted chocolate mixture and mix until all the ingredients are thoroughly combined. With the help of a flat object such as a glass or measuring cup, press this mixture evenly into the prepared pan, then place this in the freezer or refrigerator until set, at least 15 to 30 minutes. 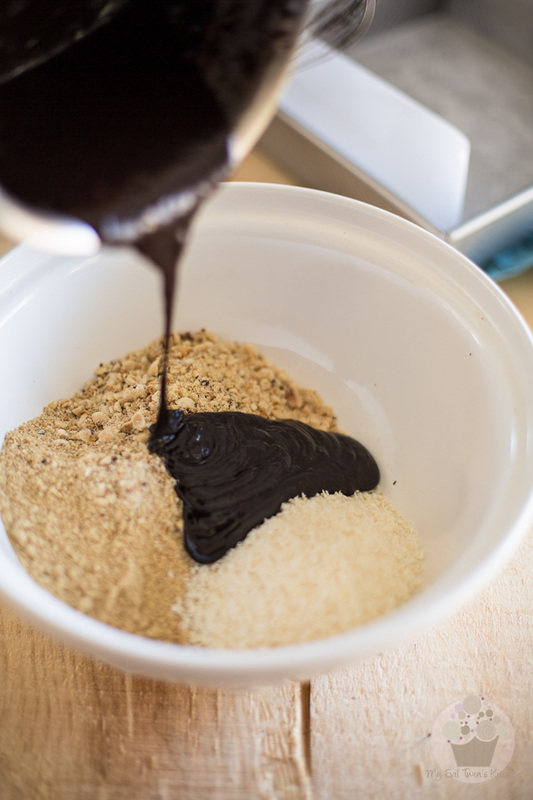 Dilute the instant coffee powder in the hot water and put that in a large mixing bowl, along with the butter. 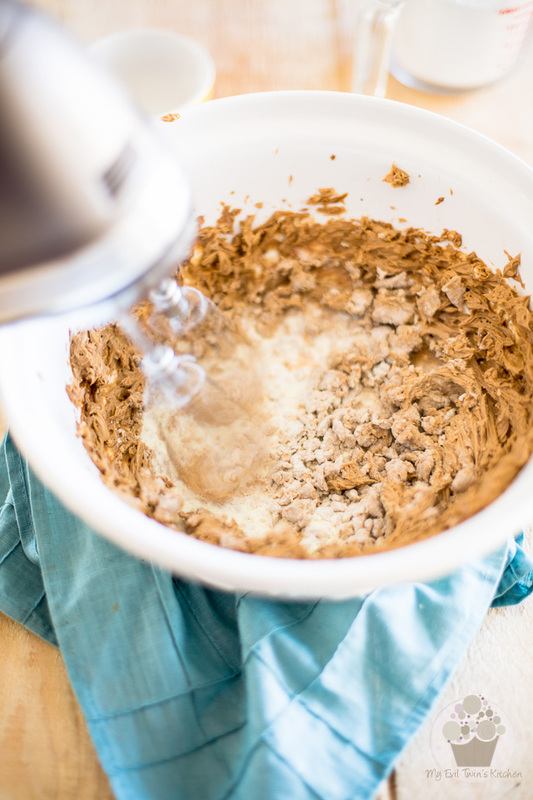 Mix with a hand mixer on medium-high speed until well combined. Add the dry buttermilk to the creamed butter and resume mixing until well incorporated. Then, add the icing sugar and mix well, starting on low speed and progressibly moving to high, until the filling becomes super smooth and creamy. Prepare a piping cone out of parchment paper. 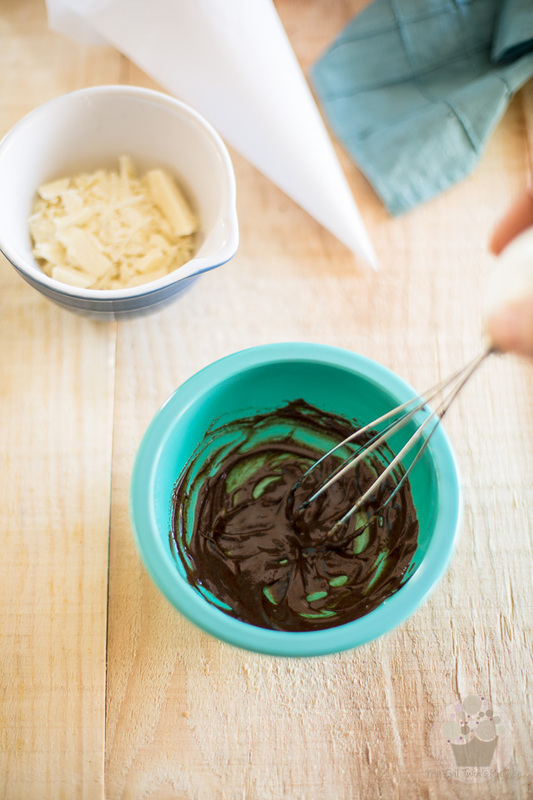 Combine the chocolate and butter in a medium bowl and melt over a double boiler or in the microwave. If using the microwave, make sure you stop and stir every 30 seconds so you don't end up burning your chocolate. Whatever you do, do not let your chocolate get excessively hot, otherwise it would melt your coffee filling. You just want it to get hot enough so it fully melts. 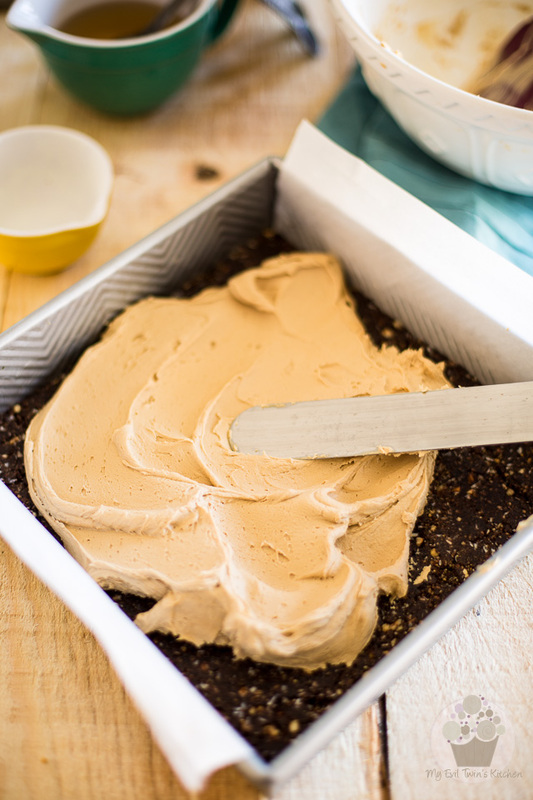 Stir until smooth and creamy, then pour over the filling and spread evenly all the way to the edge with a spatula or knife. 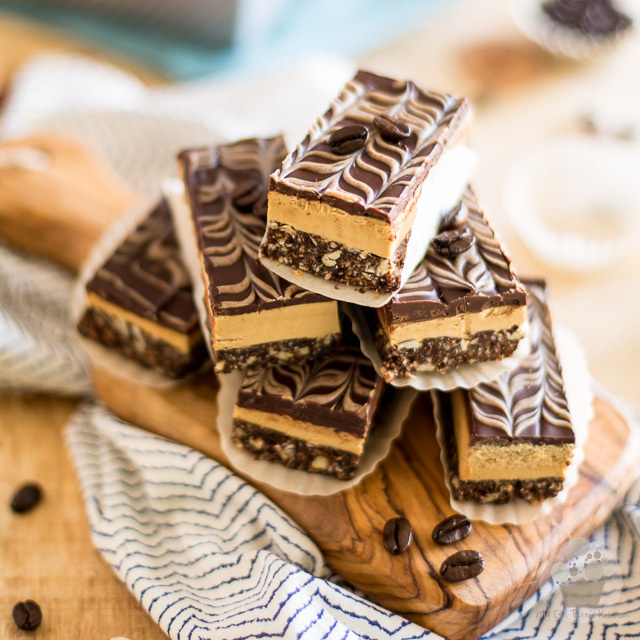 If making the feathered pattern, quickly drizzle the coffee flavored white chocolate over the dark chocolate topping. Work in a back and forth motion, creating straight parallel lines as you go. Next, take a long wooden skewer and carefully pull it across the lines in one direction, then in the opposite way. Repeat going left, right, left, right, until you have completed the design. Freeze or refrigerate the bars again to let the topping cool and set, about 15 minutes. 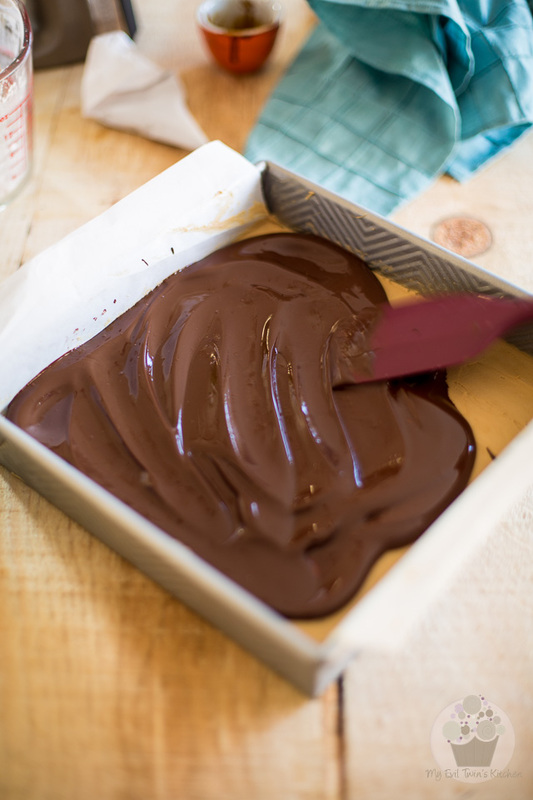 Once the chocolate topping has set, remove the bars from the pan by holding the edges of the overhanging parchment paper to gently lift them out. 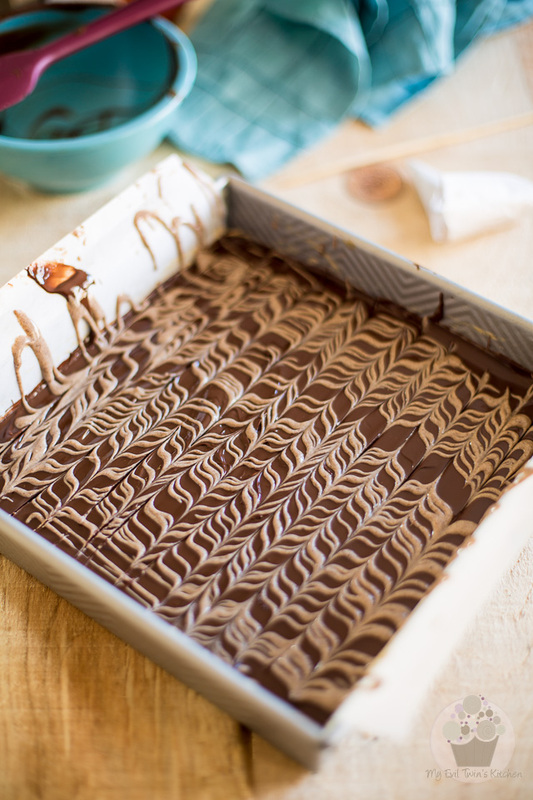 Use a sharp knife to slice into 16 bars. Run the knife under hot water and then wipe it dry after each cut for cleaner looking bars. I love the idea of a gluten free version of them but can I omit dry buttermilk or substitute it with something else? Thank you! You may leave it out entirely, Rita, but you’ll probably have to use a little bit more powdered sugar to compensate.